My heart sank when I read this. It CAN’T get any worse, can it? Then I realized I was reading about Ukraine. Here, to give you something to think about besides the elections are accounts of two meetings in the last 48 hours, the County Airport Advisory Committee and the Humboldt Harbor Working Group. On the latter website, look up at the banner and click on “Community Forums” to see what’s coming up. The Airport group meets on the 4th Tuesday of each month, currently at the Prosperity Center, 520 E Street. Eureka. I won’t give a blow-by-blow description because they have a very competent secretary, Mr. Fenton, who provides minutes of the meetings, so here’s just a few of the juicier items that came up. -The Quest For Another Carrier. A small delegation from ACV ( Gregg Foster and Emily Jacobs, according to the Fly Humboldt Facebook page) staff will travel to Edmonton for a meeting on June 3 with THREE major airlines. These meetings were described as something like Shark Tank with numbers and load factors being bandied about. Apparently we were the only small airport to get meetings with THREE possibles, so that’s good work. This is against a backdrop of United cutting service to Vegas and cutting a Portland route which also serviced Eugene. Not specifically addressed at the meeting but clearly on everyone’s mind was trend by UAL and other majors to dump their low-volume routes in favor of jumbo jets (the “Dreamliner”) carrying big crowds to big cities. We wish the ACV folks well in Edmonton. If you’ve ever been there, you know they’re not going for fun. -The FAA is not the easiest agency to work with. -The proposal to rename the airport the gawdawful “California Redwood Coast -Humboldt County Airport” is alive and well and the Committee will be writing to the BOS and to Jared Huffman soon for backing. Those of us who want to stop this abomination should act quickly. This County has already provided enough fodder for the late-nite comedians. Maybe the FAA will save us from ourselves. EAST-WEST CONNECT- Ryan Burns was at the sparsely-attended Harbor group meeting and provided his usual excellent reportage on LOCO so I won’t duplicate him, not that I could. Bottom line is they’re looking for $300,000 for another study and have already been turned down by CALTRANS. This will be a long slog, but I’m a north-south advocate, so what do I know? The last time I went to one of the Humboldt Bay Harbor Working Group’s monthly community forums I noted how downspirited everyone was after listening to an hour of “no”. No, the east-west train doesn’t pencil out. No, there isn’t enough identified freight to make it work. No, no, no. Yesterday’s meeting was completely different. The Timber Heritage Association reminded us that there are FEASIBLE projects to bring more jobs and more tourists, and everyone left in a good mood. There ‘s a lot of work ahead, but as someone said, there’s a light at the end of this tunnel. Back to the THA which since 1977 has worked hard for a railroad museum and a round-the -Bay tourist train, and is shortly starting its summer schedule of speeder rides (if you haven’t been on one, speeders are crew cars that look kind of like a caboose.) They run from the Samoa Cookhouse on a short run, only 20 minutes or so but by God, it’s a train ride. Your kids will love it and so will you. The speeder rides are in Samoa four times a year, in Old Town Eureka twice, in Fortuna for the Apple Harvest Days and and have recently started runs in Loleta (check the schedules on the website.) 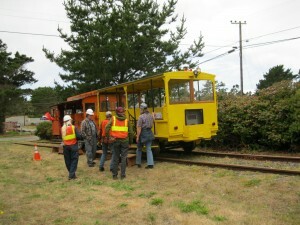 The steam train rides at Ft Humboldt are all done by THA volunteers during the summer months. By now it should be clear that the THA is a major refuge for train nuts (like me) and they have rolling stock scattered around the county until a real museum can be organized. If you have never ventured down the road behind the Cookhouse, go check it out. They have several train cars right there, all of which are worthy of preservation. Pete Johnston, who delivered the excellent presentation, pointed out that the Skunk is the major tourist attraction in Mendocino now and if we had a train museum and an opportunity for a train ride, that would be enough to get tourists to stop HERE, rather than shooting past us to Bend or other places with train-related attractions. Did you know the Samoa roundhouse is one of only four on the entire West Coast? That the THA is sustained by 6000 hours of volunteer labor a year? That’s dedication and one day it will benefit the entire county. So go ride the speeders and support the THA. I’ve donated before but never joined up but I have now, just wrote them a check for $25 and if I can do it , you can, and should. They have a couple of fundraisers coming up and last year the Salmon, Oysters Ales and Rails BBQ in August was completely sold out (500 tickets.) 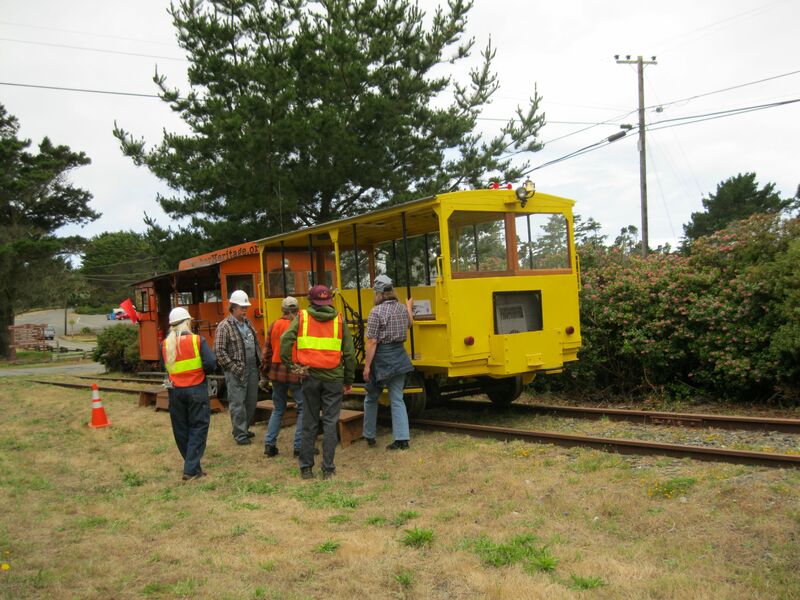 Trains have been a big part of Humboldt County history and if the THA has its way they will be a part of its future, as well. .